My diving into Finnish music! I introduced myself and asked about names of musical instruments (kitara, rummut, saksofoni, mikrofoni)! Fantastic evening with pleasant music and friendly people! Some people told me that Finns do not like to invite other people to their home, explaination is easy – it’s the most private place of every person and Finns as I know now like to have private space. But different people – different points of view. Selina kindly invited me to her home and moreover, allowed me to invite 4 my friends! 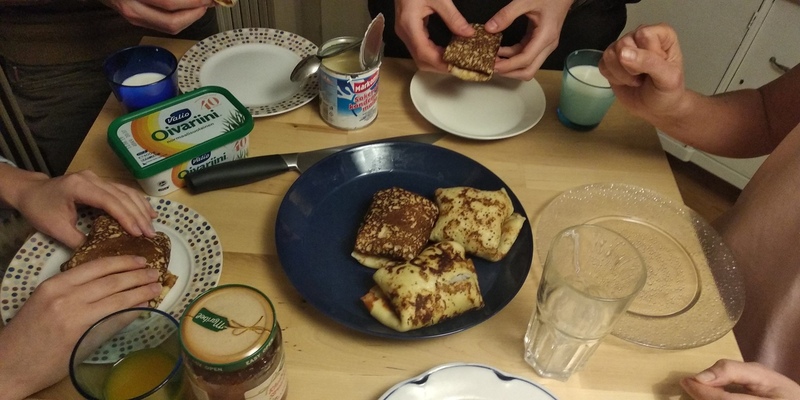 It was time of maslenitsa (Russian pancake festival), that’s why Russians come together and cook blini, Selina invited us to celebrate this event with her. 10 March was like celebration Maslenitsa at home: we were cooking and talking, talking and cooking, we learnt with each other how to say sugar -sokeri – сахар, salt – suola – соль, milk – maito – молоко, and all words which we normally use during cooking process. 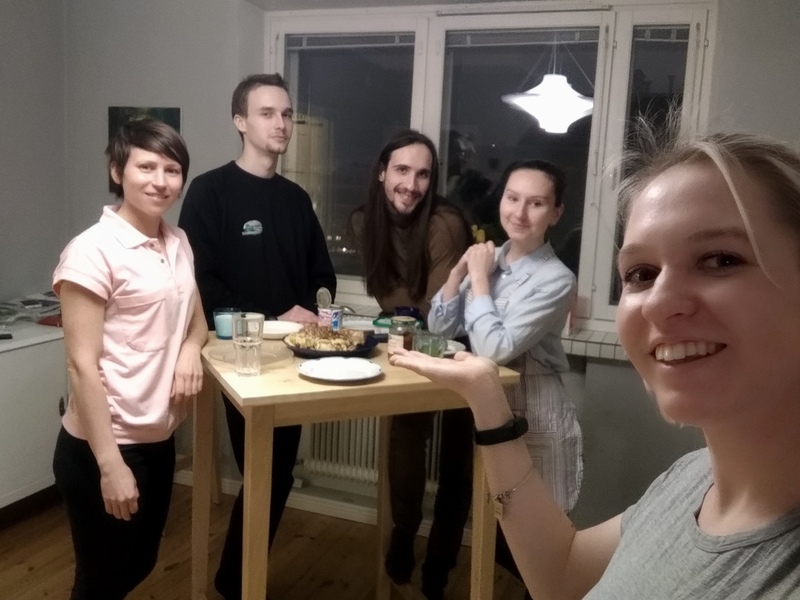 We spent a really cozy evening together with soulful discussion about cultures, learning a list of new words, full stomachs and a really happy mood! Friday evening on 22 Feb 2019 wasn’t just as an ordinary Friday. It was the day of my first meeting with my partner Selina. I asked her to show me one of her favourite place, and now I’m with 100% can say that this place is my favourite too. Arthouse cinema and cafe “Niagara” was the best place for the meeting. The part about dicussing differences between cultures took the most of time. As Russian, unfortunately, I HAD a lot of stereotypes that we are the same with Finnish people, because we are located too close, the weather conditions are the similar, but when I came here, I realized how I was wrong! Now I everyday break through the shell of my lack of knowledge, and understand how everything, just every peace of our countires effect on people’s mind. So, we were speaking at least 3 hours and to be honest, I’m so happy that Selina is my language partner: we are from different countries and different ages, but nevertheless, from my point of view, we are really on the same wave and it’s the main point, because if people feel uncomfortable with each other it will not have any sense, that’s why I could say for sure that I’m lucky one, because not with everyone you could speak 3 hours about everything. We decided to start our deep dive into learning process from next meeting, which will be on 7.03: Selina will show me her favourite places in Tampere (City tour) and after we will start our lesson in the cozy caffeteria.